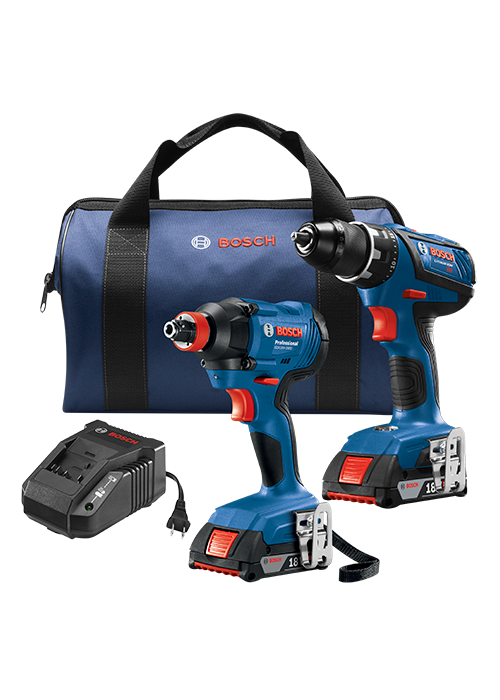 The Bosch GXL18 V-232B22 18 V 2-Tool Combo Kit features two tools designed to deliver professional cordless drilling and driving performance. The GDX18 V-1600 Bit/Socket Impact Driver has a two-in-one chuck that combines a 1/4 In. quick-change hex shank with power groove for bits, with a 1/2 In. square drive for sockets. Its motor produces up to 1,600 In.-Lbs. of torque. The DDS181A Compact Tough 1/2 In. Drill/Driver has an upgraded metal chuck, and its motor delivers the same power as conventional 18 V motors in a more compact size. It produces 600 In.-Lbs. of torque and two drilling speeds (0-1,900 RPM for high speed and 0-500 RPM for high power). This kit includes two 18 V 2.0 Ah SlimPack batteries and a charger.